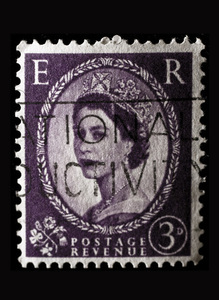 In this body of work, each individual postage stamp functions as a historical document. I view all of them as such because they have traveled through time during political revolutions, cultural celebrations, inner turmoil, crisis, prosperity and so on. It is interesting to imagine their journey and the stories that they could tell, to think of the person who sent them on their path and the one who received them at their journey’s end. This collection was not retrieved from my own personal letters, but from those of a complete stranger. Sorting through the thousands of stamps is an experience in itself because their story is so unfamiliar to me. The only thing I know about them I derive from the text that has been printed on top of the image. This allows me to venture off into a daydream of what was happening in the world, the things that these stamps witnessed, what the letters spoke of, and the type of relationship that was shared. The original owner of the collection is now passed, so by doing this work I am carrying on both her life’s journey and also that of the stamps. I present them on fabric in order to preserve their story and to display their ability to interweave time, history, politics, society, love, friendship and culture. Their presence pinned within the frame likens them to that of a tapestry hanging on the wall, as they mingle with and become part of the fabric itself. Originally from Atlanta, Georgia, Carrie Crumbley now works and resides in Denton, Texas. She obtained her Bachelors in International Studies with a minor in Photography from The University of North Texas in Denton. In 2012, the artist exhibited at the Cora Stafford Gallery in Denton, and with the 500X Gallery in two exhibitions, Hot-N-Sweaty and 500XPO. Crumbley’s work deals with a range of subjects including spirituality, religion, philosophy, and culture. Place Stamp Here is an exhibition of photographed postage stamps that function as historical documents. The images on the stamps reveal their journey through political revolutions, cultural celebrations, inner turmoil and prosperity.